Just like every other culture, Armenians have their own traditions, styles, and needs when it comes to weddings. And if there’s one thing that Armenians are known for, it’s their long, extravagant wedding days. For the bride and groom, a typical Armenian wedding day will begin at 6:00 A.M. and won’t be finished until the early hours of the morning. It’s a long, joyous day filled with multiple parties, many traditions, plenty of food, and (almost too much) dancing! When Armenians celebrate a wedding, they really celebrate. Some of the older Armenian wedding traditions are beginning to fade away, including some that are related to the proposal; however, some families are keeping them alive. Here’s a general overview of what happens. After the soon-to-be-groom has already proposed to the woman he wants to marry, sometimes there is a small traditional gathering held called the “khosk-arnel”. This roughly translates to “asking for permission”. The khosk-arnel is a gathering which includes the immediate family of both the bride and groom. They are invited over usually for coffee, tea, and dinner. 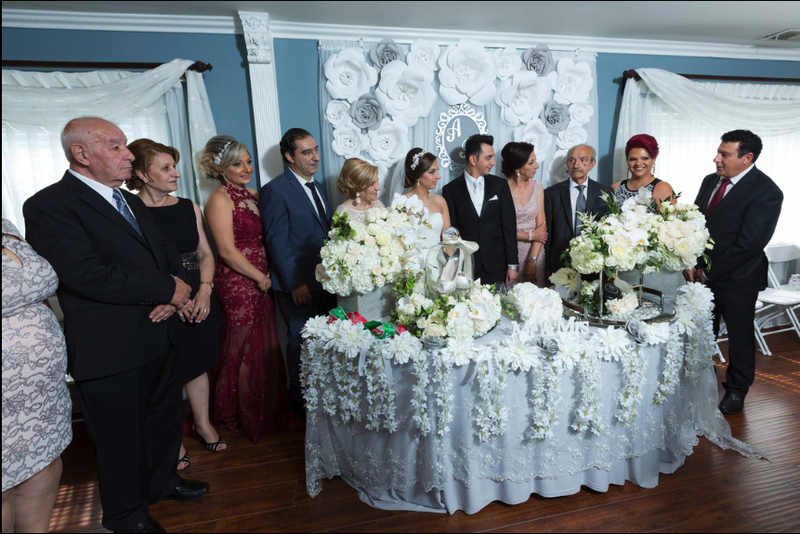 The purpose of this gathering sets the scene for the groom’s family to formally ask the bride’s family for the bride’s hand in marriage. The groom’s family typically arrives with gifts including floral arrangements, chocolates, and sometimes cognac to enjoy after dinner. Another proposal tradition is the “khosk-kap”. This is similar to the khosk-arnel—only this time, extended family and close friends are also invited. This event allows the two sides of the family to meet each other in a social setting and get to know each other. The groom’s family brings over similar gifts, and permission for marriage is also asked of the bride’s family. The khosk-kap may take the place of a traditional engagement party for some families. It all depends on what the families would like to do, as well as how soon they plan to get married. If the wedding date is more than a year away, typically families may do both: a khosk–kap along with a traditional engagement party. The day of the wedding is a rush of emotions, and extremely hectic. 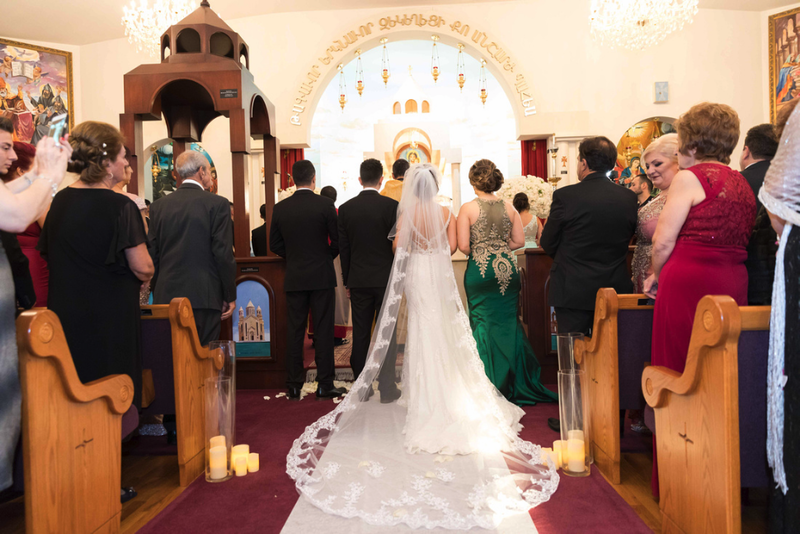 For Armenians, there are a number of events and traditions that the couple needs to go through besides the actual wedding ceremony and reception. The groom, his family, and his groomsmen get dressed and take photos at his house in the morning. After this, they head over to the bride’s house, and get together for an elaborate party with the bride’s immediate family, extended family, and bridesmaids. The groom and his family bring over gifts. This often includes the bride’s wedding shoes, perfume, flowers, chocolate, cognac, and sometimes her bridal veil as well. 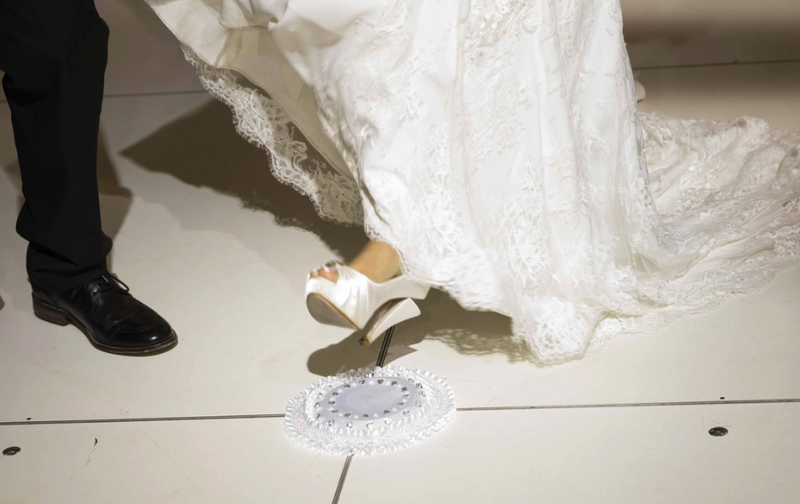 One of the cuter Armenian wedding traditions is holding one of the bride’s shoes for ransom. A member of the bridal party will hold one of her shoes “hostage” until the groom or groomsmen pay a price to have it returned to her. Once it’s returned, the shoe is slipped onto the bride’s foot and her outfit is complete. Some traditions include also placing money into the shoe before it gets placed onto the bride’s foot. The party at the bride’s house is filled with food, drinks, music, dancing, and photography. The party is usually catered with delicious finger foods for the guests to enjoy, as well as alcoholic beverages. A traditional Armenian folklore band called “zurna dhol” typically plays music during the majority of the party at the bride’s home. This band will also accompany the wedding party as they leave her home and head to the limousine. The party will usually last approximately two hours as everyone takes pictures with the bride. Before the bride and groom leave, the brother of the bride (or a younger male relative of hers) acts as a bouncer and stands at the door, traditionally with a sword, and asks for money from the “kavor” (best man) in order to “allow” the bride to leave. Usually the best man or groom will offer a small amount of money to the bouncer, and it will be rejected. They will then begin to increase the sum of money until the bouncer deems it to be an acceptable amount. Many families get creative with this tradition and make it unique. After the party at the bride’s home, guests will head to the church for the wedding ceremony with a priest. As with many other cultures, religion is important in Armenian society. The ceremony is almost always held at a church, as opposed to another type of venue. Typically the church that is chosen is one that either of the families has attended over the years, although this is not always the case. Most couples will take their wedding photos after the ceremony, although sometimes that process is reversed and the photos will be done before the church and vows. Armenian wedding photos don’t differ much from those of other cultures. The wedding party will travel to a beautiful location with their wedding photographer to take photos and videos for a few hours. After the photos, it’s time to head to the reception venue. Finding the right banquet hall is extremely important in Armenian culture. The wedding reception is almost exclusively held at an event venue, and rarely held at any outside locations. Armenian banquet halls typically hold more guests than the average event venue. Armenian weddings usually have a fairly high guest count, which means that the banquet halls need plenty of space to accommodate everyone comfortably. 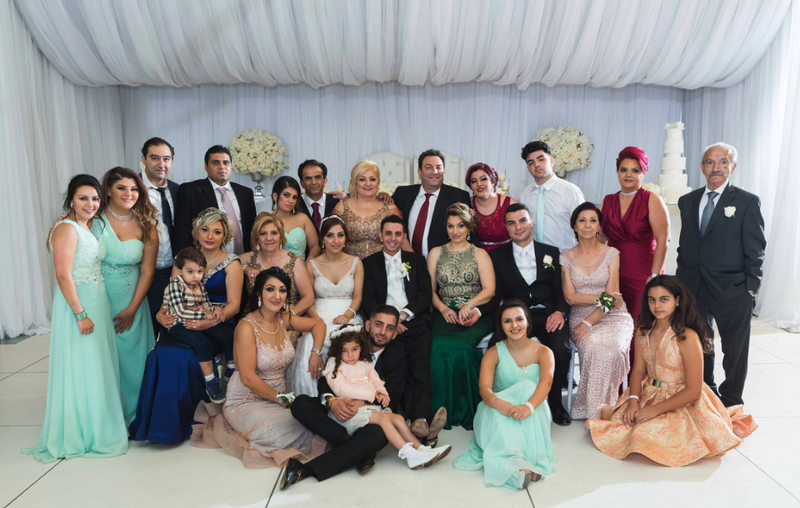 You can expect anywhere from 200 to 500 guests for a standard Armenian wedding. That’s a lot of aunts, uncles, and cousins! Armenian banquet halls will usually have a large dance floor for guests to celebrate the night away. Dancing is a large part of the culture, and guests usually dance from the beginning to the very end. 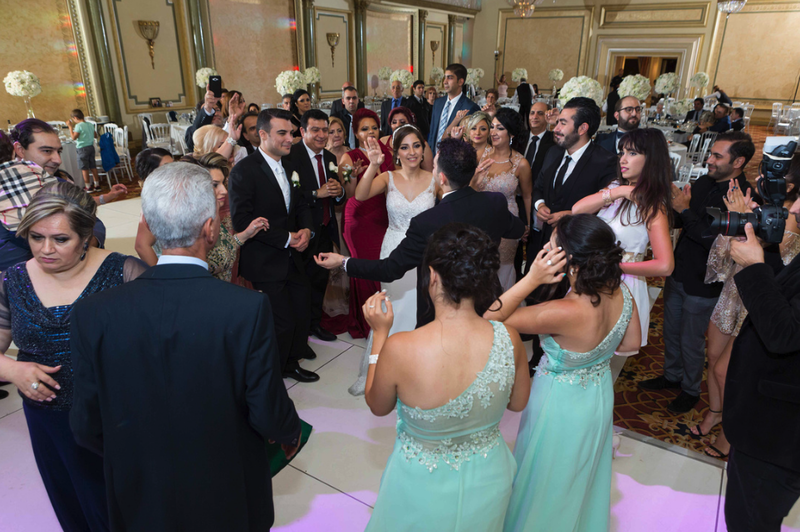 Once the guests have settled into their seats at the Armenian banquet hall, the bridesmaids and groomsmen enter the venue in pairs. Typically each pair (one bridesmaid and one groomsman) will dance their way into the banquet hall and cheer everyone on. The two will then continue cheering and dancing until the entire wedding party has entered. After all of the wedding party has entered, everyone will head to the dance floor to celebrate the newlywed couple by dancing and singing for about 10-15 minutes before heading back to their seats. 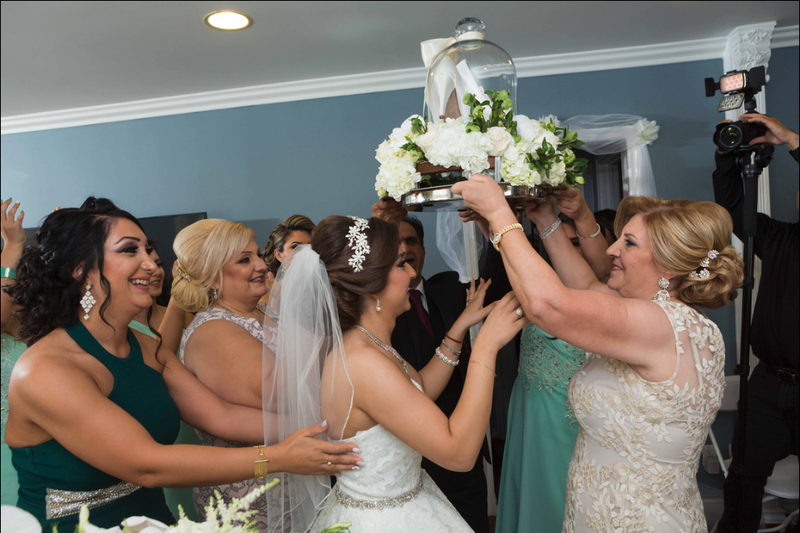 Before entering the Armenian banquet hall, the newlywed couple will sometimes step on a plate and break it (and maybe even break their heels like in the photo above!). The “breaking the plate” tradition is meant to bring good luck to the newlywed couple. This is similar to the plate breaking tradition at Greek weddings. Like other newlyweds, Armenian couples will often have a wedding registry to make it easier for guests to purchase gifts for them. However, the most common gift that is given at the banquet hall is money. This is because money is thought of as the best way to provide the couple with the means to start their new journey in life together. You’ll never go hungry when attending a wedding at an Armenian banquet hall! To start, the tables are filled with an array of delicious appetizers including breads, charcuterie boards, salads, and other savory finger foods. Finding the right catering service for an Armenian wedding is an important decision. It’s very common for Armenian couples to serve cultural foods including rice, stews, chicken and beef kabobs, and much more. Armenian wedding food is always plentiful for guests. Guests can easily go back for seconds, thirds, and even fourths if they want! Once the guests are fed, it’s time to hit the dance floor for the rest of the night. At Armenian weddings, it’s imperative that all the guests help celebrate the newlywed couple by singing and dancing with them on the dance floor. While slower songs are sometimes played, the music tends to stay upbeat with a quick tempo so that the energy stays up. The bridesmaids and groomsmen play an important role in the reception. Part of their responsibility is to make sure that the dance floor is always full and the party doesn’t stop. If the members of the wedding party are on the dance floor celebrating, it entices the guests to stay on the dance floor to celebrate. Usually around dinnertime, the newlywed couple will make their way around the banquet hall to greet their guests. Since most of the guests will be at their tables eating dinner, this is the ideal time for the bride and groom to say hello and thank them for being there. Typically the bride and groom will spend a few minutes at each table to greet the guests. More often than not, the guests will urge the couple to have a drink with them. This may be a nice gesture from the guests, but when you have 20-30 tables to go through, all those drinks can really wear on the couple, especially since they have minimal time to sit and eat. It’s best if the couple simply sips on a drink so things don’t get out of hand. Most guests will leave the Armenian banquet hall late into the night. It isn’t unusual for an Armenian wedding to last until 2:00 A.M. or longer. By this point in the night, everyone’s legs are most likely very tired from all the dancing, but there’s still a buzz in the air from all the excitement and celebration. As every Armenian knows, getting out of any party can take forever. Armenians are known for having very long goodbyes. Once you decide to leave, it may take another 20-30 minutes before everyone has said their goodbyes and hugged each other. And along the way, there’s always someone urging you to stay and keep partying. It’s a long process, but the love shown to each other makes it all worth it in the end. Are you tired yet? As you can probably tell from reading this, the Armenian wedding process is both fun and exhausting. Close family members and the wedding party have a long day ahead of them. With multiple parties, an extraordinary amount of dancing, and plenty of food, by the end of the night you will find yourself completely exhausted. But after all of that, you’ll probably still be buzzing from the excitement of a close friend or relative getting married. It’s the most important day of their life, and you just helped them celebrate it. You know that they’ll be thankful for the energy that you gave them! This is the process that Imperial Event Venue goes through every time we help host a beautiful Armenian wedding. We know the standards that the couple and their guests hold us to, which means every decision made is well thought out in order to provide the best experience for our clients. 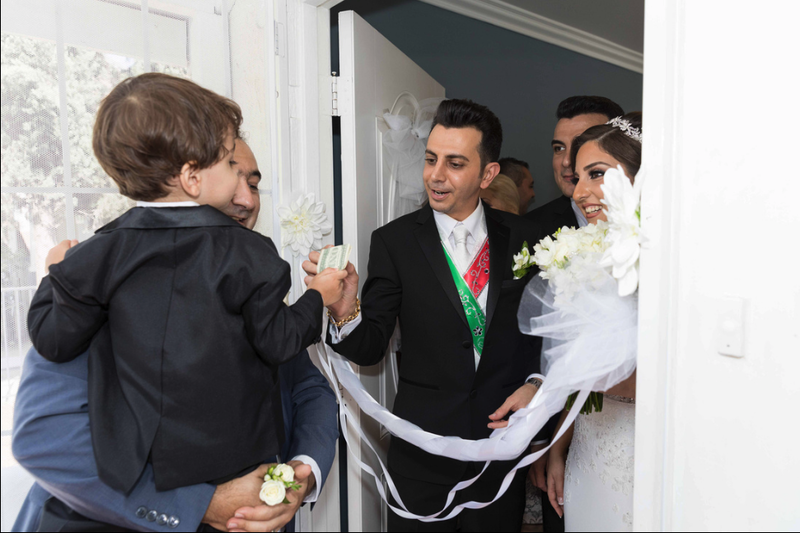 If you’re interested in hosting your wedding at an Armenian banquet hall, we are proud to provide one of the very best in the Los Angeles area. Please don’t hesitate to contact us, and we will walk you through the process step-by-step!